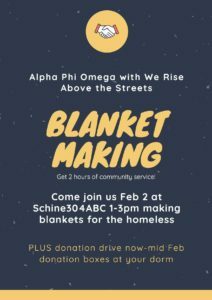 The professional service fraternity, Alpha Phi Omega, is putting on a community service event February 2 from 1 pm -3 pm in Schine 304ABC. Students will be making knit blankets, toiletry kits and sandwiches for a local Syracuse homeless shelter, We Rise Above the Streets. Come and get two hours of community service while supporting the Syracuse community! Along with this, we are also hosting a clothing drive for We Rise Above the Streets. Bins will be placed in Schine, on the mount, in Dellplain and Ernie Davis, Lawrinson Hall, the Honors building, etc. Bins will be in the dorms from Feb 1 – February 15.